These changes will produce obstruction of airways, coughing, wheezing, and chest tightness, fast breathing, running nose; a severe asthma leads to low level of blood oxygen and a serious breath shortening. 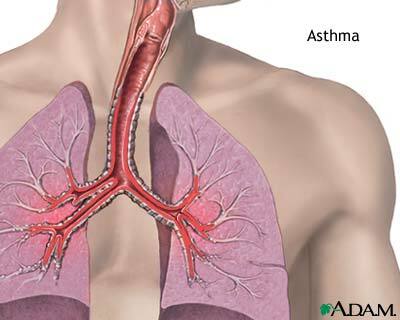 Asthma being a chronic disease is due to swelling of inner lining of airways. Airways will then have an extra mucous and there is a muscle spasm around the airways. Every individual suffers with different severity levels of this inflammation. Asthma is a form of an allergic complication in which inflammation of airways is common in all patients of asthma. According to recent studies, this sort of inflammation is causative in an asthmatic condition. This inflammation is basically produced due to many reasons such as viral infections of a respiratory system, irritants of airborne tracts; any form of allergy, weather, emotions and exercise etc.This form of airborne inflammation can cause scarring if unchecked for a very long period. Asthma not being contagious is a lifetime disease and can be controlled with routine medications. Although it is chronic yet anyone can have a sudden and acute attack with symptoms of asthma. WHAT TO DO DURING THE ATTACK? A patient should follow the doctor’s instructions for asthma.Albuterol treatment would be helpful as a first-aid medication. Encourage to cough for the sake of chest clearance. Taking liquids like water and fresh juices will help keeping mucous loose so that an asthmatic patient can cough it easily. Until a patient cough or breathes rapidly, asthmatic conditions cannot be detected clearly. Such patients more often suffer with a respiratory illness. Hidden asthma can then produce some recognizable symptoms that sometimes even a doctor fail to distinguish between an abnormal and a normal breath. Pulmonary function test reveals many cases of airways obstruction. Asthma is a chronic disorder, especially in childhood as it affects 6.2 million children of under 13 ages. Genetic factors always play an important role in this ailment along with some environmental factors. Its a really informatory article. I really appreciate this and these type of articles should be shared with everyone. I was very proud to find this site. I needed to thank you for this special read. I definitely savored every little bit of it and I have you bookmarked to find out new stuff you post. I think one of the hardest things for me is becoming too caught up in reps and sets. Lets say I plan on doing 4 sets of 12 reps sometimes I make it so I have to hit those exactly when maybe 3 sets was enough and on my last set I only got 10 reps but I quickly lower the weight and bust out 2 more reps.